Note: Nikon has not introduced any Nikon 1 camera or lens since 2015. The factory that was making these products has been closed down. It’s entirely unclear whether the Nikon 1 lineup will ever see any additional products developed. Nikon surprised the world in 2011 with the introduction of the Nikon 1, shipping two camera models, several lenses, and a new accessory line. The surprises were basically two: (1) the use of a small 1” sensor in Nikon’s mirrorless system; and (2) the incredible autofocus performance Nikon managed in these mirrorless models. That focus performance was unmatched by any mirrorless camera at the time, and was near DSLR levels. Even today, the Nikon 1 autofocus system is still at or near the top of the heap in mirrorless, despite many advances by competitors and few by Nikon. Moreover, the Nikon 1 products can manage focus at speeds up to 20 fps. The Nikon 1 was that far ahead of its time, basically. But it’s that 1” sensor that’s what most people look at. Compared to a full frame sensor, Nikon’s use of this far smaller sensor puts the Nikon 1 models about three stops behind the full frame cameras, all else equal. But they’re behind the m4/3 and APS sensor mirrorless cameras, too. It didn’t help that Nikon grossly overpriced the Nikon 1 when it came out. At the original prices, the cameras just didn’t sell. At later discounted prices that were more reflective of the value of the product, they sold decently. J series — a small rangefinder-style camera that uses the rear LCD for composing (no EVF option). This series of bodies refined the same basic camera over five yearly updates, plus it was used to create an underwater version, the AW1. V series — a small, more DSLR-like camera that includes an EVF (built-in or optional). Unlike the J series, the V series design jumps all over the place, with not a single one of the three iterations being much like anything previous. S series — an attempt to make a truly consumer, feature-light version of the J series, and to push the body size even smaller. Over the course of the Nikon’s history the 1” sensors Nikon used have gone from a 10mp Aptina-supplied one (J1) to a 20mp Sony-supplied one (J5), with several stops in between. From an image quality standpoint, only the 20mp sensor in the J5 is at the highest current standards for 1” as I write this, thus making the J5 the preferred Nikon 1 model for anyone seeking the best possible image quality from this series. But that model is now three years old and hasn't been updated. In terms of lenses, Nikon was inconsistent. Lenses that stand out are in bold in the above list. The rest are decent, but either aren’t exceptional enough to get excited about, or have drawbacks (particularly the 11-27.5mm, which is missing stabilization). There are two stunning lenses in that list, though. The 32mm f/1.2 is probably the best small camera portrait lens I’ve encountered. It’s an 85mm equivalent, is optically brilliant, and the fast aperture manages to bring subject isolation even to the very small 1” sensor bodies. Meanwhile, the 70-300mm f/4.5-5.6 with any of the Nikon 1 bodies makes for the most portable long-reach wildlife combination available. We’re at 800mm equivalent at the long end, yet at just over a pound and only a bit over 4” long when retracted. The fast autofocus of the Nikon 1 cameras coupled with this small telephoto zoom make for pretty decent birds-in-flight capability. Essentially, a V2 (maybe V3 with the EVF) and a 70-300mm are a birders delight. One frustrating aspect of the Nikon 1 series is that all the accessories—flash, GPS, etc.—are not compatible with the DSLR accessories, and vice versa. This is just seriously bad decision making on Nikon’s part, though they did re-use some DSLR batteries in the Nikon 1 cameras. 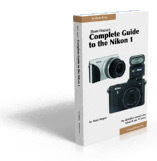 The bad news is that Nikon appears to have completely abandoned the Nikon 1 line. We got no new cameras or lenses in 2016, 2017, and 2018, and the Nikon 1 lineup seems completely stalled at this point.